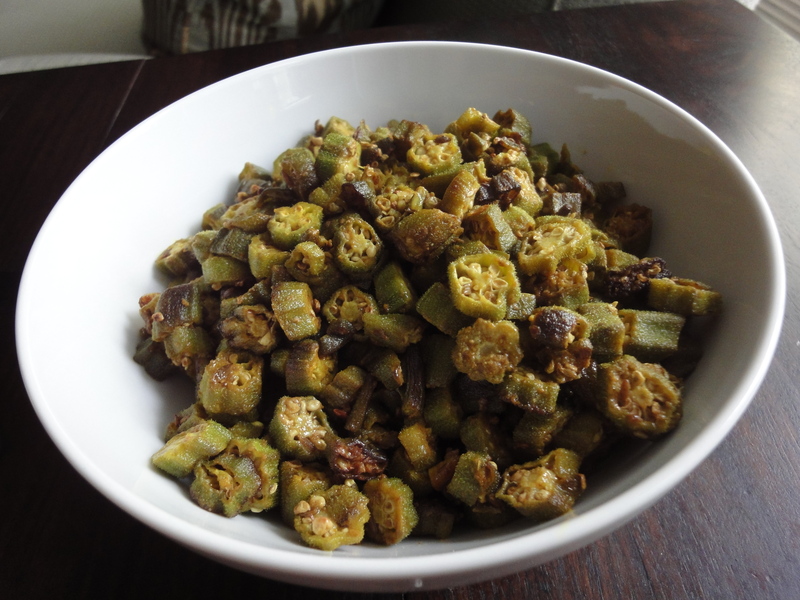 Sometimes when I am in the kitchen, the strongest association that I have with the food, in this case okra, is the memory of a two-and-half year old Agastya hovering around, helping in some way or just getting involved in the vegetable that I am making. My mother has always claimed that all little children love okra, called bhindi in Hindi, and Agastya has been no exception. He loves eating stir-fried okra on his own, fingers eagerly cramming the crispy green circles into his mouth. I do not ever need to follow him around with a plate of food that holds okra to bribe or tempt him to eat a morsel. This means that when I tell him that I am about to make okra, his little body comes expectantly into the kitchen to inspect what I am doing. He demands to be placed on the counter while I chop. Agastya excitedly fingers the okra, examines its shape and texture, and counts the chopped pieces that emerge from my board. He finds it fascinating that I cut off the “heads” and “tails” of the okra, and that the okra has several names such as bhindi and lady’s finger. His excitement reminds me of how I always imagine chopped bhindi tails to be the fallen tails of house lizards that reside in practically every home in India. I make a quick mental note that I must point out house lizards to Agastya when we next visit India. It is very hard to find good bhindi here in the greater New York metropolitan area. The Indian stores in Jersey City always carry okra, but they are frequently old, fibrous, hard, and nearly impossible to cook. Another source is an organic store called Sobsey’s here in Hoboken that occasionally carries very fresh okra imported from Mexico. And for a short while during the summer, local Jersey-grown okra makes an appearance in the farmers’ markets, and these are just the opposite of the ones in the Indian stores: they are a bright emerald green, glistening, thin, fresh, small and very tender. While holding a basket of these delectable treasures, I will often have a quick daydream that someone has handed me a paper cone with crisply fried whole tiny green okra, tossed with a generous sprinkling of salt and red chilli powder. Sometimes I am transported to a sleepy afternoon on the Greek island of Hydra where my husband and I stumbled upon a restaurant that brought us small whole okra cooked in a tomato and onion sauce. Agastya had proceeded to eat the entire plate, savoring each bite. We had watched on, relieved that our son had found something to satisfy his tummy. The best way to enjoy okra’s natural rich earthy flavor is to simply cut fresh okra (washed and thoroughly dried) into 1/4″ inch rounds. Heat a generous quantity of oil in a non-stick pan on medium heat, say about 3-4 tablespoons of oil for 2 pounds of okra, and throw in the chopped vegetable when the oil becomes hot. There will be a sizzling sound as the okra hits the hot oil. Cook uncovered, stirring every few minutes, until the okra browns, becomes soft and starts looking crisp at the edges. This takes a little while, and it is important to not add any salt until the okra is done. Covering the okra while cooking and adding salt both cause water to be released from the vegetable. This hampers the cooking process, leaving the okra raw. After the okra is cooked, add salt and a generous sprinkling of turmeric. Cook for just a minute or two and the dish is ready to eat. Note that okra shrinks down to an alarmingly small quantity after cooking. For instance, 2 pounds of fresh uncooked okra will only serve 2 adults and one or two small children. Btw, i miss the strong whiff of indian spices, and indian food that used to greet me whenever I walked into your apartment in hoboken. It used to be such a nice familiar smell, especially when I used to come visit from college.